Unfortunately for Col. Meriwether Lewis Clark Jr, he never got to see the Kentucky Derby become the grand spectacle it is today. However his legacy lives on at Churchill Downs, the racetrack he helped build back in 1875. Churchill Downs gets its name from Clark’s uncles, John and Henry Churchill, who helped raise their nephew after the death of his mother, Abigail Churchill. The two Churchills leased/donated 80 acres of their family property in Louisville, Kentucky to Lewis, and also provided the funding for the construction of the new racetrack he wanted to build. This was a gorgeous plot of rural land located by the Louisville and Nashville Railroad track, also known as “The Old Reliable,” one of the great railroads of its time. Horses were able to travel from miles around to compete. Aside from the race course itself, which includes a one-mile dirt oval and a seven-furlong turf track, the most prominent feature of Churchill Downs is the grandstand. Designed by Joseph Dominic Baldez in 1895, the grandstand is topped by two twin spires, which also make up the corporation’s logo. The spires were refurbished as part of the massive $120-million renovations Churchill Downs undertook between 2001 and 2005. This wasn’t the first face lift Churchill Downs has experienced. When Clark first fell into financial disarray in the Panic of 1893, he sold the track to a syndicate led by William Applegate, who commissioned the building of the grandstand. Col. Matt Winn would pour more resources into Churchill Downs after taking over in 1902. Winn had a new clubhouse built in order to make the Kentucky Derby a more sociable event. He also brought pari-mutuel betting machines to the track in 1908. If you visit the clubhouse today, you’ll notice a mural by Pierre Bellocq, the French-American artist who also worked as the staff cartoonist for the Daily Racing Form from 1955 to 2008. Bellocq’s 36-foot mural, part of the 2001-2005 renovations, originally showed all the winning Kentucky Derby jockeys from 1875 to 2004. Bellocq came back in 2008 to add more jockeys and create another mural depicting all the winning trainers. More renovations are planned in time for the 2014 Kentucky Derby, with Churchill Downs having announced that they are installing a high-definition video board facing the grandstand and field. It is reportedly the world’s largest video board of its kind – bigger than three NBA courts. Make sure as well to visit the Kentucky Derby Museum, which opened in 1985 and features a series of can’t-miss exhibits, including race footage of every Run for the Roses and the Kentucky Derby contenders from 1918 onward. You can also visit the Champions’ cemetery, where Brokers Tip (1933), Swaps (1955), Carry Back (1961) and Sunny’s Halo (1983) are interred. 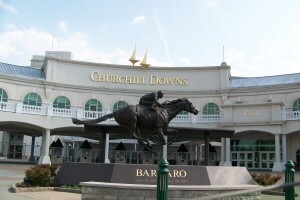 Barbaro (2006) is interred outside one of the entrances to Churchill Downs so that his visitors don’t have to pay admission. The thoroughbred racing season at Churchill Downs is separated into the spring meet, which starts the week before the Kentucky Derby and runs until July, and the fall meet, which starts in October and closes on Thanksgiving weekend at the end of November. The Derby itself is always run on the first Saturday in May. Over 150,000 people attend the Kentucky Derby, although “only” about 50,000 of those will be seated to watch the race itself. Many will bet on the Kentucky Derby too. Make sure to put it on your bucket list if you haven’t already been there.